It's always a bit of a challenge when we photograph weddings at banquet facilities that are large spaces to create unique and interesting wedding photos. During this first dance we erected two flashes one in front and one behind in order to create a sandwich effect of lighting on the couple. One gives a rim light in order to separate the subject from the background while the one in front lights them up. The two lights are dialed to different strengths in order to match the scene. The chandeliers played a nice role in this photo as they gave context to what is happening. This kiss that took place at the end of the dance was a perfect moment caught with fantastic lighting and in putting extra effort into having the right Nikon gear and technical knowledge allows us to create images that stand apart from the rest of wedding photographers. I also like how in the background the guests look on at the newly married couple. 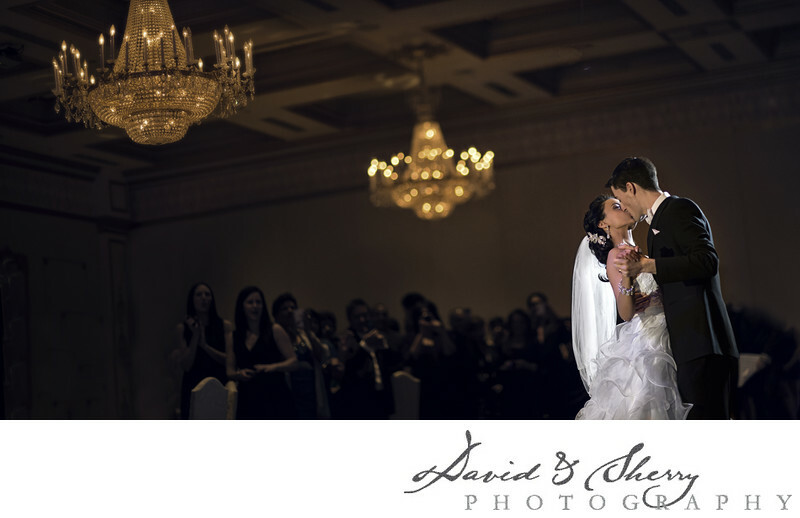 This particular wedding took place at the Venetian Banquet Centre in Vaughan which is a very popular wedding venue and in our experience they have given great customer service to our clients. Location: 219 Romina Dr, Concord, ON L4K 4V3.